Primer is a type of paint intended as a base coat underneath the paint chosen for color. It is generally white and is used in a variety of applications, all of which share the purpose of preparing the surface for the top coat. Primer is used in most painting projects - depending on the situation it can be seen as either a helpful preparatory step or something that is required for the job at hand. Unfinished surfaces - those that have never been painted, stained or sealed - always benefit from 1 or 2 coats of primer before adding the top coat of the desired color. Primer is made to bond to unfinished surfaces and in turn creates a surface that the top coat will adhere to. Without primer, more coats of paint are needed and there is a greater likelihood of peeling, chipping or an uneven finish. Sheetrock is the material used for interior walls in most modern homes. It is an extremely porous material and primer is needed to seal the surface so it is receptive to tinted interior paint. Make sure to use a primer intended for interior use - low VOC, water-based primers are the preferred choice for sheetrock walls. A minimum of one coat is needed, but two is preferable. The porosity of wood depends on the type, but it never hurts to start with a coat of primer. Softwoods, like pine, definitely benefit from a coat of primer, though it can usually be skipped when painting a hardwood, such as oak. Interior wood surfaces can be primed with the same water-based primers used on sheetrock. For exterior applications, an oil-based primer - or a water-based primer that is indicated for exterior use - should be used. When painting an exterior surface that has been exposed to the elements for more than a few months, it always a good idea to sand it down before applying the primer. Metal primer is typically silver in color and can be applied as a spray or brushed on. It is important for creating a 'tacky' surface for the top coat to stick to and is imperative if rust is present on the surface. Rusty areas should be sanded smooth and cleaned thoroughly before applying the primer. Make sure to use a primer that is intended specifically for metal. Primer also comes into play when you want give a fresh coat of paint to a previously painted or stained surface, whether just to change the color or because the surface is faded or peeling. 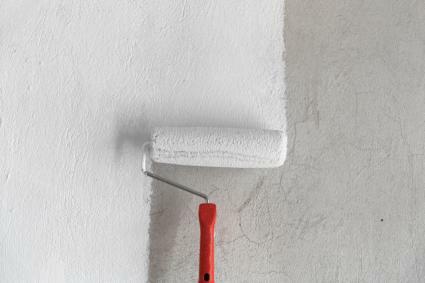 Whenever you want to change the wall color from a darker tone to a lighter one, you're going to need primer. Otherwise, the darker color will be somewhat visible under the lighter shade. Continue adding coats of primer until the color underneath is no longer visible - it can take up to four coats to cover a black or dark red surface. Peeling paint or worn out wood stain should be sanded down, cleaned and then primed before adding fresh paint. Where there is an uneven finish after years of weathering or multiple layers of old paint, the primer helps to establish a clean, even surface for the new paint to stick to. Primer is the only way to cover stains caused by water and mildew. Just like when covering a dark wall color, you have to keep adding coats of primer until the stain is no longer visible through it. For an even finish with the top coat, you'll want to paint the entire surface with each coat of primer, not just the stained area. Primer can also help mildew from forming on painted surfaces, making it especially crucial in kitchens, bathrooms and exterior locations. Special mildew-blocking primer is available, or you can buy mildewcide and mix it into a bucket of primer. The one case where primer definitely isn't needed it to cover a light-colored painted surface with a darker color of paint. As long as the new color is a similar shade or darker, there is no need to use primer first to keep it from bleeding through. If the surface being covered is old, chipped paint, however, you'll want to use primer even if the new color is darker. You can get away without priming in some situations, but more paint is needed and the painted surface will generally deteriorate quicker. You may as well make the effort to prepare the surface with a coat or two of primer to provide the best-looking and longest lasting finish.